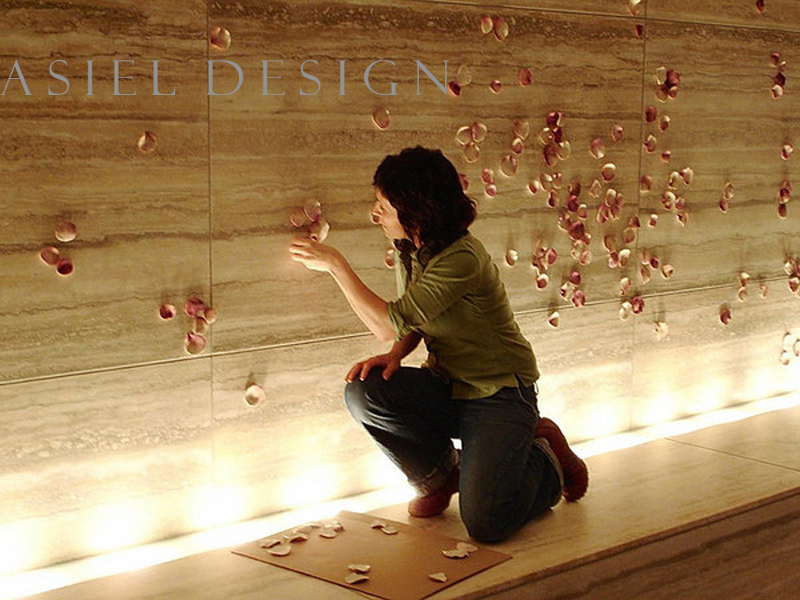 Years ago I was doing a walk through with a client at the San Francisco St Regis, when I was blown away by the petal art designed on the wall. I loved the coloring and details they provided as they danced across the wall. I wanted to create a piece that partnered in that dance, to be part of this beautiful element. Pascale Girardin is the artist. 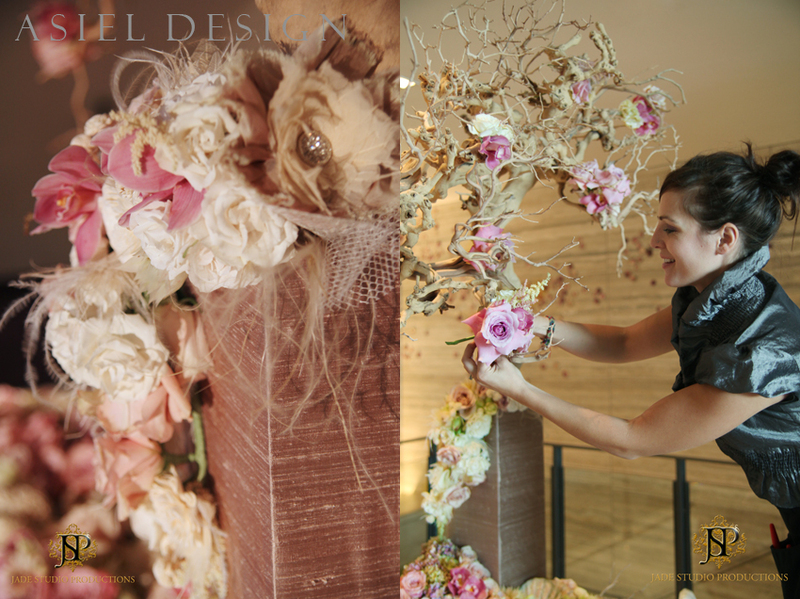 She hand created each petal and placed them in a beautiful wind blown stream on the wall (as pictured above). I love to think “out side of the box”. 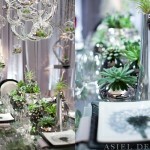 I feel that in weddings, the box can be the idea of a “center” piece. Why does the centerpiece always come from the center of the table? I wanted to do something that started from the side of the table and worked its way over. I am a fanatic for architectural elements so I started with Nature’s best – Fig vine. I built the sand blasted tree combining Fig vine with Manzanita. I also love dried mushrooms. They have gotten a bad rap as a “granola girl’s flower” so I wanted to glam them up and make them feel like a waving ruffle. 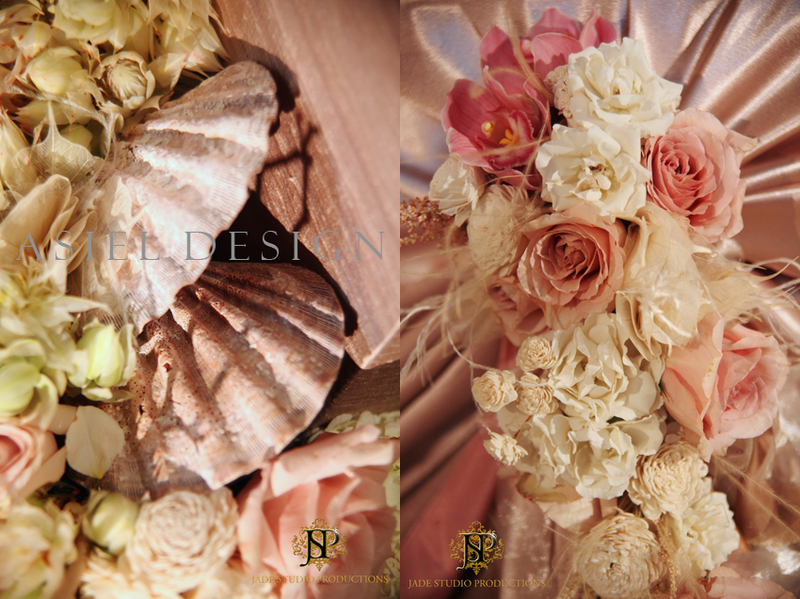 I also incorporated seashells that had the mauve tones deep inset within the flowers. These played off of the flow of the petals on the wall. The flowers are in dusty pink and mauve. 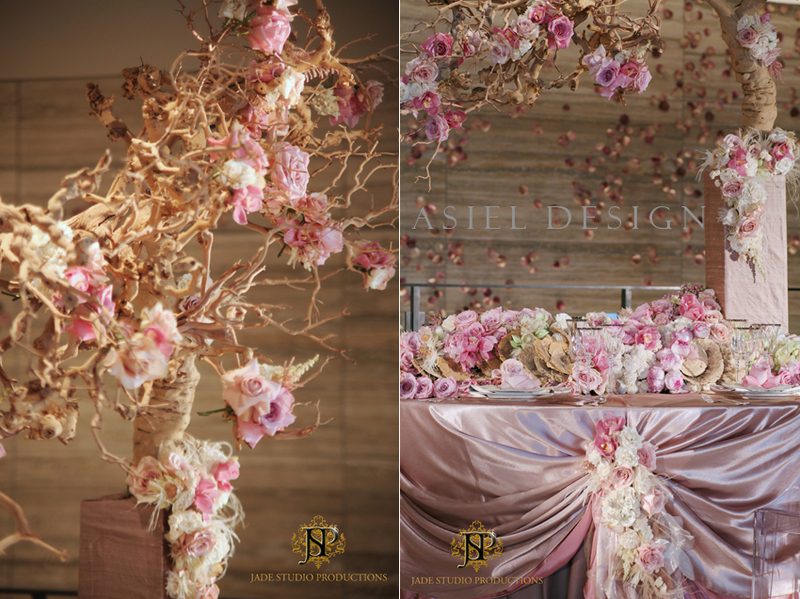 We worked with ruffly full blooms to offset the harsher elements of branches, mushrooms and shells. 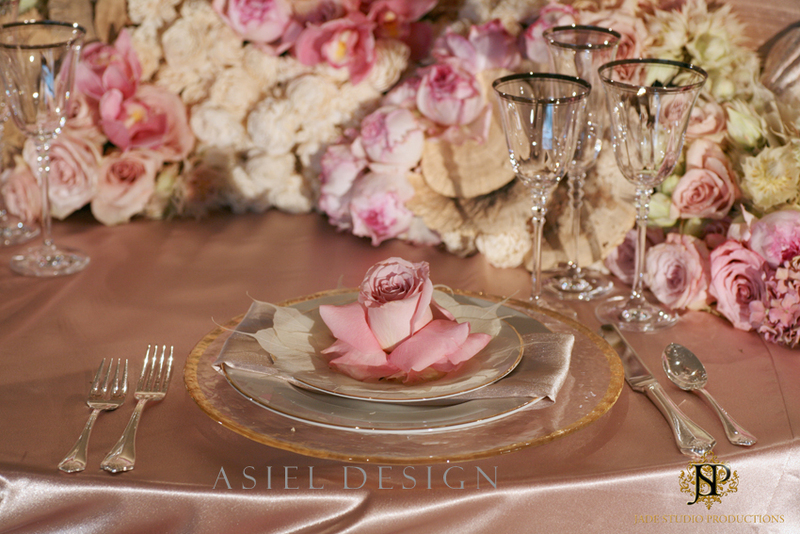 We were excited to have Grace Ormonde magazine feature this table design in her magazine (Spring/Summer 2010 p. 124). Hartmann Studios partnered with us providing the tabletop and chairs/rentals. We love working with them as they have great, affordable, elegant pieces. Wildflower Linen created our custom linen layering many fabrics to fall at various levels. We love to start with beauty and add to it – Thank you St Regis for the inspiration. 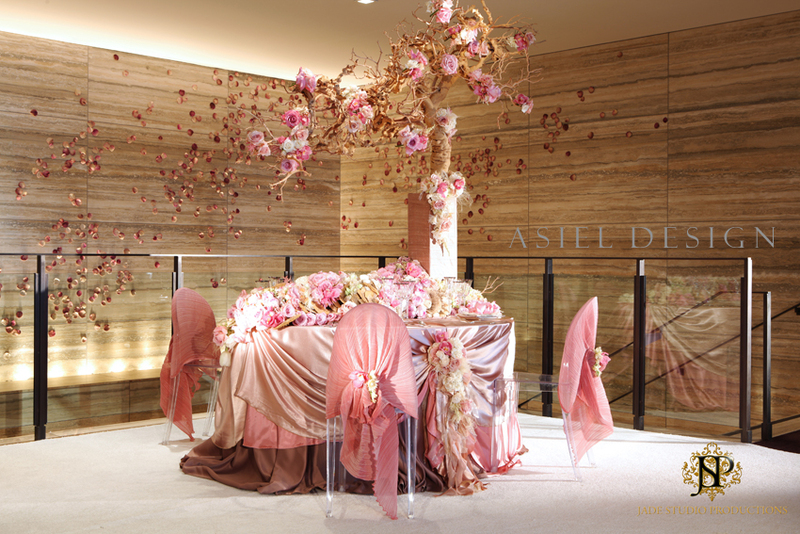 Thank you Pascale Girardin for bringing beauty to SF. Thank you Philippe for capturing the moment. 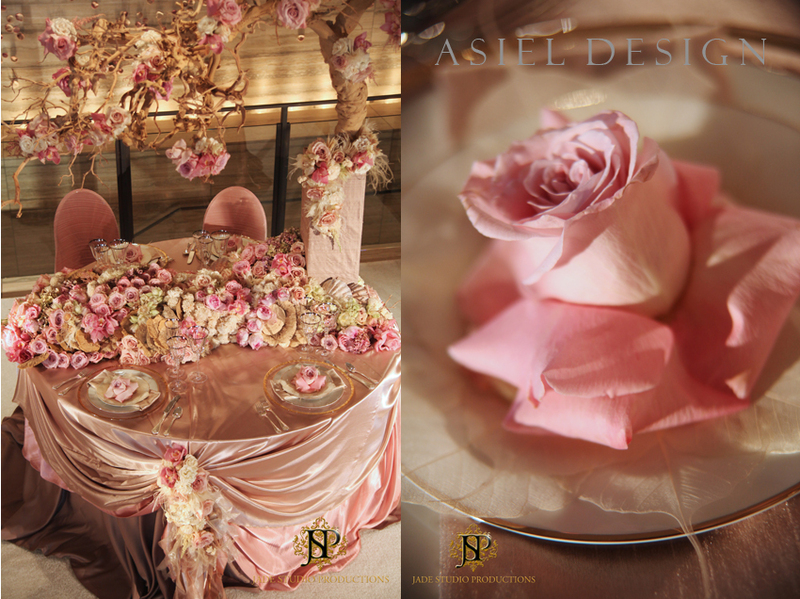 This entry was posted in Cream, Feminine, Opulent, Pink, Sculptural, St Regis, SF and tagged Grace ormonde, Spring, tablescape. Bookmark the permalink. I wire corsage like pieces. Then I wire all of those together so its almost like a garland or head wreath. Then those are pinned on to the fabric in one spot. Light weight durable flowers are the best. I used feathers and dried berries as well as flowers. Thank you for following us.